Preheat the oven to 170°C/150˚C fan/gas mark 3. In a bowl, beat the butter together with 125g of the sugar until pale and creamy. Add the egg and beat to combine. Sift over flour, baking powder and 30g of the cocoa and mix to combine. Stir in the milk, vanilla and whiskey (if using). Add the pieces of chocolate and stir to combine. Divide the mixture between four ramekins and set aside. In a heatproof bowl, combine the remaining sugar and remaining cocoa. Add 180ml boiling water and stir to combine. Pour this mixture over the puddings. Bake for 15-20 minutes until the puddings are risen and set around the edges. 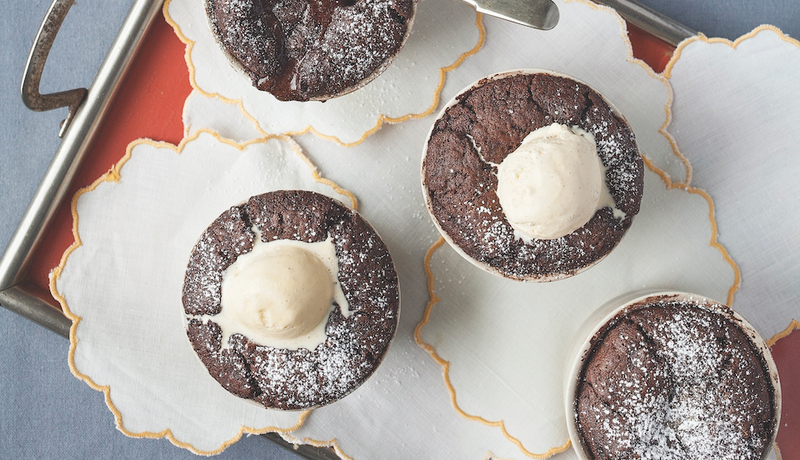 Dust the puddings lightly with icing sugar and serve hot with good-quality vanilla ice cream.